(AP) - Manfred Wilke loves nothing more than speeding down the German Autobahn in his 911 coupe. Gazing at a 911 Carrera GTS with a 100,000 euro ($125,000) price tag in Porsche's flagship showroom in Berlin, the real estate manager said only cars like the sporting two-seater deserved to carry the Porsche badge. He is one of a number of Porsche purists who are appalled at the Stuttgart-based sports car maker's aggressive push into sport utility vehicles and family-style saloons. Nearly 50 years after the launch of the 911, its newer, more roomy siblings, the Cayenne SUV and four-door Panamera, account for almost three quarters of Porsche's sales, and some customers fear the company is straying too far from its racing roots. "Only delusional marketers could attempt to turn Porsche into an offroader company," said Wilke, 53. "It's a flat-out insult to Porsche's image and fame." The powerful 911, driven by Steve McQueen at the start of the 1971 movie "Le Mans", has captivated -- and sometimes frightened -- fans for decades and came fifth in the 1999 Car of the Century awards. Its timeless design, refreshed again last year, evolved from the Porsche 356 designed by Ferry Porsche in 1948, the sports car maker's first vehicle in series production. But for now the bulky foor-door cars are king, as demand for large luxury models is growing faster than the sports car market. Porsche's next major new model is a compact SUV called the Macan, which goes into production in 2013. "Even at Porsche, SUVs promise stronger growth than the classical two-door sports cars," said Willi Diez, head of the Institute for Automobile Industry in Nuertingen and an adviser to former Mercedes-Benz CEO Helmut Werner. "The Cayenne, Macan and Panamera become the profit-laden springboard needed to develop the core Porsche stuff." Diez and other see Porsche becoming a two-brand company with the 911 and its other sports cars sitting alongside a portfolio of top-end luxury models. Other marques such as Ferrari and Lamborghini have kept largely to sports cars, leaving their parents Fiat and Volkswagen to develop other types of cars. Turning its focus from one of the world's most recognizable sports cars to the bulky Cayenne was not a natural progression, but a necessity if Porsche was to hit its targets. Bolstered by its alliance with Europe's biggest car maker Volkswagen, Porsche aims to sell 200,000 cars a year by 2018, up from 116,978 last year. It wants to keep its return on sales above 15 percent after achieving 18.7 percent last year. 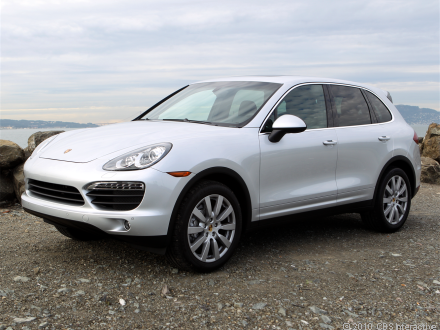 Sales of the Cayenne, which saves costs by sharing a platform with VW's Touareg and Audi's Q7 SUV models, are expected to surge 4 0 percent in major auto markets to 52,076 vehicles by 2017 from 2010, research firm IHS Automotive predicts. The Macan should hit almost 37,000 in its first five years, and sales of the Panamera could jump 67 percent to 33,643. Porsche sold 17,607 911s last year and IHS expects a slower growth rate in the next five years of about 37 percent. Porsche is spending 500 million euros to expand its factory in the eastern German city of Leipzig, adding body and paint shops and a new assembly line to produce the Macan. Porsche also increased production of the Cayenne and the Panamera in January. But Porsche's efforts to meet demand for upscale 4x4s has cost it the top spot in terms of its cars' perceived sporting image, according to a survey of 4,000 consumers by Germany's ADAC automobile club, Europe's largest. "There seems to be a greater emphasis (at Porsche) on short-term sales gains at the expense of the famous brand's image," said ADAC analyst Marcus Krueger. But others said the overall Porsche brand was benefiting from the broader product range and the onus was on Porsche to keep the 911 at the top of its game. "Porsche still stands for luxury and performance. But it is also important that flagship brands such as the 911 continue to convince through innovation," said Cassidy Morgan, head of Central and Eastern Europe at brand consultancy Interbrand. Porsche, which achieves high ratings in quality studies by companies such as J.D. Power & Associates, maintains that brand perception is vital. The brand, the product of Porsche's racing heritage, "is the most important reason to buy a Porsche," Chief Executive Officer Matthias Mueller has said. Porsche sales chief Bernhard Maier told Reuters the company was not neglecting its sports car line but was creating demand with new models after revamped versions of the 911 and the Boxster roadster reached showrooms in December and in April. A new version of the hardtop Cayman two-seater will be launched later this year, and the 918 Spyder - a 768,000-euro plug-in hybrid supercar - will arrive next year, Maier said. Helmut Becker, a former chief economist at BMW who now runs a consulting firm in Munich, said Porsche's new-found passion for big cars made business sense, even if it turns away purists. "Two-seater sports cars are completely uneconomical, their customer base is shrinking," Becker told Reuters. "Even a classical sports car maker has a right to broaden its portfolio." Back in the Berlin dealership, real estate manager Wilke directed his scorn at a Panamera sedan, a car that at first glance looks like a 911 that has been elongated. The vehicle's bulky rear stems from the fact that former CEO Wendelin Wiedeking, who is 6 foot 2 (1.88m), insisted he should be able to sit comfortably in the back, a company manager has said. "The Panamera is too big and too compromised," Wilke said. "It simply lacks the timeless fascination of a 911. That's what Porsche is all about."